Whether you’re an experienced kayak angler or new to the idea, there is no doubt that finding the right gear for going on out the lake or the ocean can be time-consuming and confusing at times. But with so many great fishing kayaks on the market right now, there is no excuse to remain a shore-bound fisherman. I think that you will find that fishing kayaks are affordable and an inexpensive way to get off the shore and really focus on the fishing. Honestly, I think they are better than fly fishing canoes. Now if you have never been in a kayak, then you might be intimidated at just the thought of trying to do your fishing out on the water from one of these things. Well, get those thoughts out of your head right now! It is honestly not as bad as it seems. In fact, you will find that it’s not hard to fish from a kayak and it will soon become your preferred way of doing things. So, get your fish finder ready, cause it’s about to be fishing time. 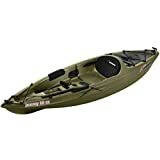 Check out this list of the top 10 fishing kayaks, with reviews for my top 5 favorite yaks below. If you are ready to do your shopping now, we have a few tips to share with you here on Outdoorsman Time that will help you pick the best value fishing kayak for the money. We’ve broken it down into four key things to consider when you’re comparison shopping out there. Probably the first thing that you need to do before buying a new kayak for fishing is to really figure out what you need because there are different types of kayaks on the market. Will you be doing your fishing in a pond, a river, a lake, or will it be some saltwater fishing out in the ocean or a harbor? Do you intend to fish alone or will you take out some buddies or family members? Now, most people prefer to have a seated kayak since fishing takes a long time. However, what you might not know is that some are single seats while others are double seats. This is really only important if you plan on fishing with someone else. Then, you will want to be sure to look for one of those double seaters. Another thing that you will notice when comparing the top fishing kayaks is that models are sold either are rigged or unrigged. The unrigged version is just the simple stock version of the vessel while the rigged one is the angler version. Now, if you are completely new to this and need to buy a good fishing kayak for beginners, then you will probably want to go with a rigged version. But, once you get a feel for things and have been doing this a while, then you will likely want to get the unrigged version so that you can outfit it on your own since you can customize it. Go with whatever makes it easier for you out there! 1. Kayak Design Matters. When you’re comparing vessels, you have to make decisions on stability vs speed and width vs length. The best choice is really a personal one for you to make. Personally, I prefer stability above all things. Do keep in mind that shorter kayaks track slower through the water. And the kayaks that are wider offer more stability. I think the best bang for your buck lies in a kayak that stable and wide with a clear deck. 2. Rigged vs Unrigged. I talked about this up above, but it is pretty important. A stock, unrigged kayak is going to be the cheaper option every single time. That being said, I only recommend this type of boat if you’ve got enough experience to know how to rig it yourself and keep the balance optimal. No one wants to be swimming around with the fishes instead of catching them, right? 3. Sit-in vs Sit-on-top. The best choice here depends on where and how you’ll be fishing. Will you be in cold water or water that has a strong current (like waves)? If so, go with a sit-in fishing kayak to stay dry and increase stability in windy conditions. Sit-ins also give you the bonus of storage that is built-in. The disadvantages are that your visibility is limited and it can take a while to get in and out of the thing. For those reasons, sit-on-top is the most popular type of fishing kayak. Of course, if you’re in windy conditions then the boat can be unstable and it can be a wet ride. But, it is easy to get out and do some wading and to add some accessories to the boat. Now that you know what to look for when shopping for your new fishing kayak on sale, let me share some of my favorite models for this year. These are all great boats that you can take out on your weekend fishing trip. And, I think you will find that there are plenty of affordable models on the market to fit any budget. If you need a fishing kayak that offers a lot of value for the money, then look no further than the Sun Dolphin Journey SS. It has an amazingly low price but offers you a lot of bang for your buck. And honestly, it has everything the beginner kayak angler needs from their boat. The seating area for this one is an open cockpit design, and it is both large and comfortable. You also have plenty of space for all your gear and accessories, including a waterproof dry box for things like your fish finder or phone, which is pretty cool. It comes with a portable accessory carrier, which comes in handy a lot. You can even tow it behind the kayak, which is really nice. Another cool feature are the adjustable foot braces, which makes it a comfortable ride for anglers of all sizes and heights. This is a good, cheap kayak for fishing that is a lot of fun to use. However, do know that the seat is not padded like the higher end models. However, that can easily be replaced, if you’re interested in that sort of thing. I think it’s also important to note that there are no scupper plugs on this model, which means that you have to physically tip the boat upside down to drain any water that gets inside of it. This is another great value rigged fishing kayak for the money. The Lifetime Sport Fisher Kayak is priced similarly to the KL Industries model above. And, you get some of the same features and value with this one. You also get two sport paddles with this boat, which is great because it saves you a little money on gear. This 10-foot fishing kayak is designed for either single or tandem use, which makes it a great versatile choice. And the backrests are nice and soft so that it is a comfortable day out on the lake. You can actually get up to three people in it’s ergonomic seating, which is nice for a family fishing outing. Or, bring the dog along! The maximum capacity is 500 pounds, which is pretty decent at this price point. One of the things that I really like about this one is that it has a tunnel hull design, which means that you can easily stand or sit in it without tipping or losing stability. There is space for four fishing poles in the holders, a dry storage hatch, scupper holes and ditty trays (among other notable features). There are also multiple footrests for fishermen of all sizes and it has molded handles so that is is easy to carry the boat to and from the water. Overall, this is a very stable kayak with some great features for the money – and all at a very affordable cost. Right now, this is really one of my favorites of the summer, and for good reason – it has an affordable price and lots of room! Plus, it just happens to be a good quality kayak for the money. It has some good features and is big enough for two people. If you need a two-seater, I think you will really like the value that the Intex Explorer K2 offers. It’s also great for the kids! 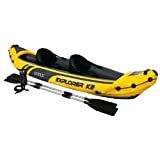 This inflatable fishing kayak only comes in yellow and has seats for two people. However, you can use this for just one person as the seats attach to the bottom with velcro, so it is easy to remove one of them. I also really like that the seats have a backrest – awesome for those long waits for something to take the bait. It has a low profile, which is perfect for doing your fishing in lakes and rivers with mild waters. And for some directional stability, this kayak has a removable skeg. It is quick to inflate and deflate, which makes taking this thing out on the water a breeze. 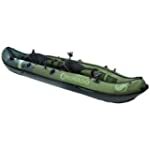 This high quality sport kayak is great for fishing and really performs well out on the water. 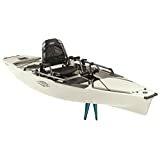 The Sea Eagle Inflatable does have two seats, but I find is easier to take this one out as a solo fishing kayak unless you’re with someone who knows how to keep the balance with you. Rugged PolyKrylar can withstand dog paws! no puntures! You and your dog will just love going out in this one – especially since you don’t have to worry about those dog paws poking holes in the kayak! Once you get yourself a new kayak for fishing, you will want to make sure that you take good care of your investment. As you probably already know, these things are not cheap so it is a good idea to just do some basic kayak maintenance every so often to keep things in tip-top shape so that your kayak lasts you for many years to come. You basic kayak maintenance routine falls into two different categories – taking care of it during fishing season when you’re out on the water using it regularly and taking care of it during the off season when it’s in storage. Since it’s fishing season right now, let’s start with what to do during fishing season. Here are some of the top things to remember when using your kayak so that you take really good care of it. UV protection is important – just like you skin, the sun’s UV rays can damage the surface of the kayak. At the start and end of the season, use some spray-on UV protectant on the boat’s surface. We recommend 303 protectant spray for the best results. Cover it up – when you’re not using it, keep that kayak cockpit covered. You’ll keep out rodents and other pests, organic debris and even mold. So, get yourself a good quality kayak cover. Practice proper kayak storage – once dry, make sure that you store your kayak out of the sun and in the proper manner. Keep reading below for more outdoor kayak storage tips. More on storing your kayak during the in-season: For a plastic kayak, you’ll want it stored on it’s edge in order to keep the hull formation in tact. Or, you can opt for upside down kayak storage where each side is supported on the deck, it is raised off the ground and a tarp is just draped over it so that you’re not restricting air flow. In the off-season, your fishing kayak maintenance is really all about proper storage techniques. And before you put it away, you better make sure that thing is both dry and clean. Get yourself a soft cloth or sponge and wipe everything down. I like to start out by removing any loose or detachable pieces and then hosing down the entire boat. After that, drain out any water and use that cloth or sponge to wipe everything clean. Then, dry it with another clean, soft cloth. Just make sure before you dry it that you’ve cleaned out every nook, cranny and crevice. The last thing you want is a family of insects to hatch in the kayak while it’s in storage! And remember to clean all the pieces and accessories as well. This includes your paddle – so, take it apart and give it the same treatment. This is also a good time to check and tighten up any loose bolts or screws. I suggest having a can of WD40 available as well – I know that I usually end up needing some! Now, before you start putting it away until next season, remember to use that UV protectant spray on it now that the season is over and done with. Keep that kayak surface looking good and in the best condition possible! Since the season is over, put that cover on the kayak, take it in your garage, shed or other indoor storage space and put it on it’s rack. If you don’t have a kayak storage rack, hopefully, you have space to store it standing up on its stern (this causes the least amount of stress on the boat). 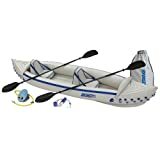 Other good storage option include a hoist system, sling system, or something like the Boone Blue Kayak Crib 2 Paddles cheap kayak storage rack. Of course, if you have a folding or inflatable kayak, then you don’t really have to worry about these storage issues. Instead, just inspect the boat for any damage before folding or rolling up until fishing season rolls around again next year (after you clean it, of course!). Whether you’re on a tight budget and looking for something like the best fishing kayak under $400 for the money or just the best value option, I’m certain that you’ll be able to find what you’re looking for out there. It might sound weird, but the sun’s ultraviolet rays can damage more than just your skin. They are also harmful to your kayak! So, if you want to keep that kayak of yours looking good and performing well without any problems when you take it out fishing, then you need to be protecting it from the UV rays. If you don’t, then you can expect the surface of your kayak to start to crack and fade. Protecting the kayak is actually really easy. In fact, all you have to do is spray the exterior of the vessel with some UV protection spray at the start of the season. Once the season is over and you’re ready to put that kayak into storage for the winter, just spray it down again. That is really all it takes – two applications of the spray on the kayak each year! So, what do you look for to get the best UV protection spray for your kayaks? Well, you’ll need something that is designed for vinyl. Often, you can find this spray at your local marine equipment shop or auto accessories shop (the same stuff is often used on personal vehicles). Or, just order the top brand online from Amazon and have it shipped right to your door. As an experienced kayaker, I think the best UV protection spray for the money is 303 spray. Just ask any kayaker out there and they will agree with me. Don’t believe me? Check out this forum thread for the proof. Click here to get your bottle of 303 UV spray from Amazon. Applying this stuff to your kayak is very easy. You just spray it on and that’s it. Now, before you spray it, make sure that the boat is both clean and dry for the best results. Otherwise, it might not work as expected. And of course, remember to store the kayak in the shade when it is not in use to prevent any extra damage to the surface. With this stuff, you’ll keep that kayak of yours looking good for many years from now. So, protect that investment today. There are a number of portable fish finders that can be used for your next trip to the river or lake. Numerous brands offer a wide range of products, in a wide range of prices. Most portable fish finders function in the same basic manner, but there are higher-end models that boast some extra bells and whistles. Not sure what you need? Check out our guide here. To help you begin your research for the best portable fish finder in your budget, we’ve compiled a list of the best models from top brands. Fish finders usually come as either handheld or mountable devises, and have a variety of features. A great entry from Humminbird, the HELIX 7 is basically an upgraded version of the HELIX 5 model, complete with an upgraded price tag. Although they have made improvements, the increased price means it’s probably not the best option for those on a tight budget. What I like: There is a nice screen size and the information is easy to read on the display. It seems to work well in greater depths compared to the previous model. What I don’t like: It takes a while to learn for new Humminbird users, and the GPS is slower than expected. Bottom line: This model offers some improvements over the HELIX 5, but it may not be worth the extra cost if you’re not a serious fisherman. However, it does perform better at higher depths than the HELIX 5 model. The Dragonfly Pro is one of Raymarine’s most well-recieved fish finders. Apart from the accuracy and quality of the sonar, it also comes equipped with U.S. and Canada navigation charts to help you plot your next excursion. What I like: The dual channel’s are simply amazing in their quality. Many other happy customers have complimented the CHIRP DownVision which will get you above average images compared to the rest of the finders on this list. What I don’t like: The actual readout is much smaller than the total length and width of the entire screen. You may have to squint when the sun is really bright. Bottom line: In my opinion, its one of the best despite its high price. Sure the screen size could use some work but for the overall performance its worth it. A good option with GPS in the lower price range is the Humminbird HELIX 5 DI GPS Fish Finder. It’s made by one of the top brands, works well, and is affordable. What I like: The screen is a decent size, and the image is very clear. Humminbird is a typically trustworthy brand. What I don’t like: The colored screen can be difficult to read on bright, sunny days. The locator only works up to 200 ft in depth, and the GPS feature isn’t incredibly accurate. Bottom line: Though there are better models out there, this one preforms well for the price. If GPS is of central importance for your fishing expeditions, it will likely be best to skip this product and move on to one of the Garmin units for better results. Lowrance is known for making great fishing gear, and this Lowrance Elite-3X is no exception. 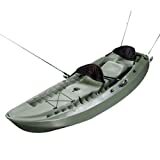 Currently this model seems to be the best cheap fish finder for kayaks. The Lowrance Elite-3X can be submerged in up to three inches of water, which makes it a good option for kayak fishing, or other situations where there are less stable mounting positions than on a boat. What I like: The high capacity brightness settings make the screen easy to see in sunny conditions. It is affordable and made by a brand I trust, easy to use, easy to mount on a kayak, and waterproof for up to three inches. What I don’t like: The screen feels a bit smaller than other options. There is no GPS feature. Bottom line: This is a great option for kayak fishing in particular, but may also work for anyone who wants a good, cheap fish finder that works well for the money. The Garmin Echo 7SV is a good and safe option in the mid-level price range. As it is made by one of the top brands in the industry, it doesn’t seem to have any major flaws and performs as expected. What I like: It is a straightforward tool: easy to install and works as expected. Garmin is a quality and trustworthy brand. The larger size means a larger screen. What I don’t like: Since it has a color screen, detailed images can be difficult to see in the sun. This, of course, is easy to work around by covering the screen with some shade, but it can be a real pain on those sunny summer days. Bottom line: Though the price is higher than some of the models reviewed here, it is a quality product that is likely to last for many years of use. Another option, instead of buying a whole new device, is to purchase a fish finder that connects to your smartphone. The Deeper Smart Portable Fish Finder unit is the best we’ve seen so far in this category. What I like: It works with both iOS and Android tablets and smart phones and has a very affordable low price. It has quality navigation and can take you where other fish finders can’t go. It is very user friendly. What I don’t like: Since this product will be paired with your smartphone, it can experience problems when the operating system is updated — like with the most recent Apple update. However, the company is pretty quick to deploy an update to the app. That being said, it can be a bit frustrating to have to manage both your phone and the device. Bottom line: This is a really great alternative to the standard models, but it is not for everyone. This product seems to be a better fit for those shore fishing or fishing from kayaks or canoes. Though this model is not the newest product on the market, the Elite-4 CHIRP can compete with the best sellers. There is no reason to upgrade to newer models if the standard offers everything you need. What I like: The Elite-4 CHIRP is made by a brand that I trust, and is made to be durable. In addition to its affordable price, it offers a split screen option and does a good job of handling lake depth data. What I don’t like: The GPS location is a bit slow compared to other models. The small screen is sometimes difficult to read in the sun. Bottom line: This is a great, durable option in the mid-price range. It performs well and will likely last several years of fishing. This Garmin Echo 101 is another affordable option, but provides a bit more value for the money. Of course, Garmin is best known for their GPS units, but this fish finder also works surprisingly well for the price. What I like: The price is very budget-friendly, and it exceeded our expectations during use. Its small size makes it easy to slip into a cargo pocket when going to or from the boat. What I don’t like: The mount stand is a very tight fit for the unit, which makes me wary of breakage in the future. It also seems to mistake weeds for fish every now and then, which I expected for this price, but is still a bit of an inconvenience. While we are big fans of the Garmin model above, the Humminbird 398ci Side Imaging Combo Chartplotter/Fishfinder gives it a run for its money. What I like: The GPS chartplotting is what gives this device its edge over the Garmin above. This GPS fish finder is an incredible deal for the money. What I don’t like: The screen is a bit smaller than the Garmin above. Bottom line: Humminbird is one of the top brands when it comes to fish finders, so it’s safe to say this will be a great addition to your fishing gear. The Striker 4 is a newer and updated version of the Echo 101 you saw above. While the Echo 101 is still in stock and a very well received device, the Striker 4 has some noticeable upgrades. First and foremost is the sonar. Clearvü sonar gives you high-quality images beneath the water wears the Echo 101 was in greyscale. What I like: The Striker 4 is cheap just like its previous version. In my opinion, you get better quality sonar and images for little difference in price. What I don’t like: Splitting the screen between sonar and navigation can make it difficult to focus on one or the other with such a narrow screen to begin with. Bottom line: If you’re new to fish finders in general, I strongly recommend the Striker 4 to start off. Its got all the perks to help you find your fish and help you navigate the surrounding area all for an affordable price. The NorCross HawkEye F33P Fish Finder is one of the best options for handheld styles at a cheap price. What I like: It is small enough to easily slip into a jacket or cargo pant pocket when not in use, but large enough that it won’t be easily lost while out in the kayak or on the shore. It is very lightweight and incredibly easy to use; even children can easily navigate the NorCross HawkEye F33P. What I don’t like: The LCD screen is a bit small and hard to read if you’re wearing your sunglasses. It is not water resistant at all, so you will need to take additional care to not get it wet. It also doesn’t do well in hot direct sunlight or temperatures below freezing. The manufacturer states that it should work down to zero degrees Fahrenheit, but that doesn’t seem to be the experience of most users. It should come as no surprise that another one of our favorite fish finders at an affordable cost is from Humminbird. The HUMMINBIRD 899ci HD SI Combo Fish Finder System is a high-end fish finder to complete your fishing equipment. What I like: As shown in the photo, it has a much larger display screen and the output on the screen is crystal clear. What I don’t like: It is hard to find too many complaints about this product. The price is slightly higher than other options, but it will be worth the money if it isn’t too much of a strain on your budget. When it comes time to upgrade your cooler to something that will actually keep your ice, well, ice, for more than a few hours, you’ll find that a good cooler is actually a pretty big investment. While Yeti is often known to be the best when it comes to coolers, our research has found that there are some comparable and even better brands at all different price points.